A cancer diagnosis can cause significant financial hardship and stress, but workplace oncology nurse navigators can help manage these burdens. 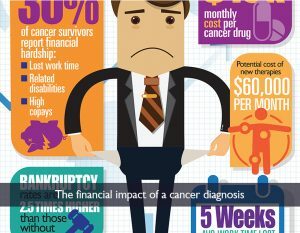 Here are some facts about the cost of cancer care, the financial impact, and how the nurse navigators can help! Learn more about the Johns Hopkins Managing Cancer at Work, a workplace oncology management program that can help your employees prevent cancer, recognize the early warning signs of the disease, and understand and manage cancer treatment for themselves or their loved ones.